ENJOY A BOTANICAL ESSENCE TO BEAUTY WITH BRAMLEY'S FOCUSED RANGE OF SKINCARE PRODUCTS, INSPIRED BY THE BRITISH COUNTRYSIDE. 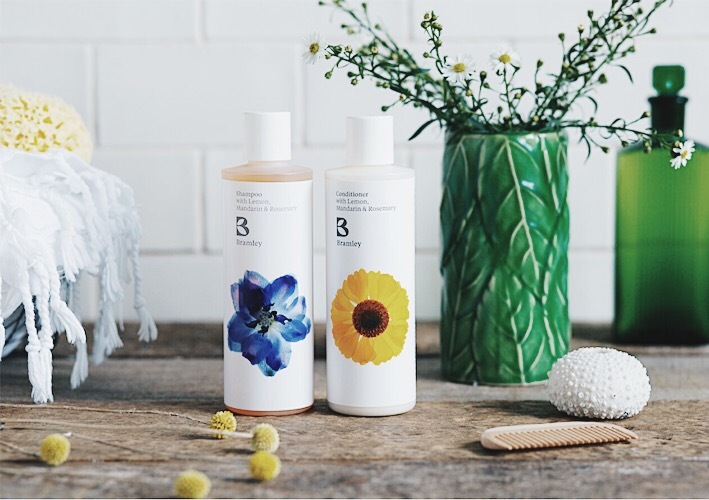 I recently stumbled across Bramley, in the form of the most beautifully scented body wash, shampoo and conditioner. I stepped out of the steam feeling utterly revived by the dreamy scents of lemon, mandarin & rosemary, grapefruit, lavender & sweet orange essential oils. Bramley products are inspired by the beauty and therapeutic properties of plants, with a love for nature that is transformed into a super-luxurious scented collection for the bath & body as well as the home. Each product is composed of its own set of bespoke ingredients, chosen for their restoring properties and compelling scents, with the power to relax and revive. Made from 100% natural botanicals, containing no chemicals or artificial colours whatsoever. The Bramley range, created by Chloe Luxton, in 2009, was first introduced to the guest bathrooms at The Beckford Arms, Wiltshire. The brand has been growing ever since, though have deliberately kept the range small and focused. Bramley can now be found in over 350 likeminded luxury hotels, restaurants and outlets. Bramley have a philosophy that I firmly stand by; the belief that nature is a powerful force and that what we put on our skin ends up on the inside, so it is of the upmost importance to ensure quality of ingredients. The established brand, firmly believe in the power of nature and are committed to sourcing naturally derived ingredients, proven to deliver results. “We wanted to produce something that really does work on lots of different levels – delivering practical results with natural ingredients and smelling amazing,” says Chloe. The small, beautifully packaged range includes only one of each product, each with their own individual fragrances and therapeutic effects – a citrus base ties the range together as a whole. Bramley have also designed a range of carefully curated body oils and diffusers, where different moods reflect different uses. The dreamy illustrations of flowers and leaves on the packaging depict the celebration of the British countryside that so inspires the range, reflecting the naturalness of the products. I keep the hand cream at my desk and on applying, always feel a sense of calm, uplifting my mind and spirit as the notes of lavender, geranium and petitgrain essential oils gently envelop me. It lingers long after the application - the perfume is just divine! Typically I also use it before going to sleep; the scent is so serene that I fall asleep in minutes. Also, it is super moisturizing and absorbs well. Bramley also believe in looking after the planet, all the essential oils are therefore fair trade, wild crafted, grown sustainably and sourced carefully with integrity. Base ingredients are naturally derived from raw items such as sugar and coconut and wax comes from soya. Packaging can be recycled and our product ingredients are biodegradable, making Bramley not only safe for the environment but also safe for your body. The ritual of washing with Bramley products is a sheer indulgence to be celebrated. The balance of a revitalizing shower and a relaxing bath has been nailed to perfection. Grapefruit, lavender and sweet orange essential oils are combined to create an energising body wash that leaves me refreshed and awake, ready to tackle the day ahead. Whilst the bubble bath combines geranium, lavender and sweet orange essential oils that blanket me in a warm cocoon of bliss, perfect before bedtime or a relaxing Sunday afternoon. Bramley products deliver an all-encompassing experience that is as indulgent as it is uplifting. I adore the simplicity of the products - the scents really do transport me to another place. I have always felt this is key; if a simple beauty ritual can take you out of your current habitat - if just for a few minutes of content - it is well worth investing in. To me, this is what beauty is all about, not so much pursuing the perfect aesthetic, rather a state of mind that leaves you feeling beautiful and serene from within.